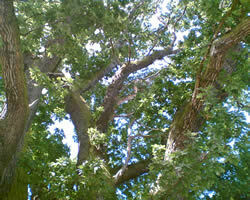 Trees may present hazards, they may also suffer from changes to their environment or from pathogenic attack. Our qualified managers are proactive in ensuring their skills in identifying hazards and problems in trees are always up to date and are able to provide you with an inspection service that will give you the information you need in a written format which is clear and easy to understand. We know trees are subject to natural processes and not all defects can be detected readily but we can provide you with clear advice on how to manage your trees and what level of regular inspection is appropriate for your situation. A quotation to carry out any works recommended in the report will be provided as part of the service. We can provide tree reports which are in a clear format and allow lenders to clearly understand the risks, if any, of trees in proximity to buildings and within gardens. These reports can normally be produced within a few days of receiving instruction. The cost of this type of report is based on location of the property and the number of trees involved, therefore please contact us for a free quotation. This is a specialist assessment method for assessing the risk of trees causing subsidence to buildings. This assessment relies on the type of soil that the property is be constructed upon and the potential for shrinkage due to the clay content. We can provide you with this assessment but can also advise you whether such an assessment is required. For further information please contact our senior Arboricultural Manager.